So much hyperbole surrounds the Kentucky Derby. For an anachronism of a sport that gets almost no attention, this one race garners more attention than every other race combined. This race will be over-thought by men, women, children and computers. Here are my thoughts on the race. My pick is Awesome Act. This is a horse who has an impressive late kick and his breeding, his training and running style should be well suited to today's race. My existential handicapping tells me that this is a horse that can overcome adversity; the Derby is all about triumph over adversity. When Awesome Act first arrived in New York his journey was an odyssey. A massive blizzard delayed his arrived for 3 days and instead of a swift journey her was grounded at a British airport for the days. While he did not have to sleep on a cot like the travelers recently grounded by the Iceland ash emergency he certainly faced situational adversity. He was then stuck in American quarantine and not able to work preceding the Gotham. On top of his travel inconveniences the Gotham was a race where Awesome Act was first time dirt. Horses that are first time dirt emerging from travel hardships are usually big failures, think Aidan O'Brien imports on B.C. day. Those O'Brien horse likely fly privately. Not only did Awesome Act win, he won in smashing style. His win was a bold statement for those paying attention. When the adversity a twenty horse field being spooked by a rabid 150K crowd materializes other horses will likely use their mind, Awesome Act should be as cool as a glacier. The other edge that Awesome Act holds is that he should love the distance. He has a bottom of English style distance training that is completely unique to the field. This bottom of stamina will be very handy running ten furlongs for the first time. With twenty horses in the race the pace figures to be taxing for the front runners. A perfect set up for a late running closer with a strong base of stamina is likely. This race should set up perfectly for Awesome Act. The explosive turn of foot he displayed in the Gotham could be the trump card in the Derby. Could he delight us like Awesome Mich? We hope so. Awesome Act is the play of the day. It has been a relative long time since the last play of the day. This due to two reasons, first there were lenten vows that restricted my play, second is that I have found it hard to engage in a product that I find disappointing. Today I see Ruffino returning from a layoff. This is a horse that always seems to run well fresh. He has run fresh 5 times and won 4 of those races. It seems that his trainer Bond knows this and sent this charge down to Florida this year. Florida horses are always deadly at Aqueduct at this time of the year. He should be ready to roll over a field of modest New York breds that have taken turns beating each other all winter. According to the morning line Ruffino is projected to be the second choice; if that is the case he is excellent value as he is clearly the most likely winner on the card. All of my eggs will be in his basket today. Perhaps it is just my point of view but it seems that racing has crossed a new threshold into irrelevance. Once dedicated fans have decreased their involvement in the sport. My wagering is down over 75% this year. While other sports are erecting new cathedrals of excellence Aqueduct has a dumpster as the local point of it's apron. It seems that all of the value in wagering and excitement of the competition has flown the coop. The programs are littered with short fields and state bred welfare races. A perfect storm of economic forces, changing tastes, poor leadership, fractured control and slots fueled indifference has led to a critical point where the whole industry's foundation has been weakened. Racing seems like it can not get out of its own way. While I really want to embrace synthetic surfaces, I find them to be the equivalent of a monkey-wrench. Racing may need change but this was the wrong change. Synthetic surfaces add complexity to a game that is already too abstract for many tastes. With races like the Blue Grass and Lexington relegated to irrelevant farces it seems like whole race meets are contested in a parallel universe that have no relevance to this(dirt racing) dimension. The false consumer morality that led tracks like Keeneland to install synthetic surfaces has led them into a tactical error. 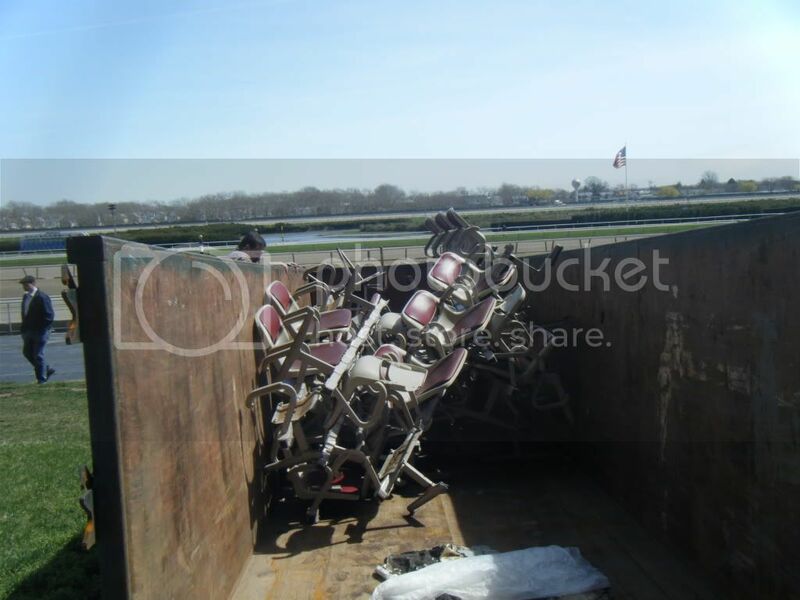 The dirt surfaces should have been upgraded and properly maintained; the new surfaces are foreign and bewildering to the majority of handicappers and horsemen. This major change the fabric of the product has quickened the rush to the doors. Here in New York the incessant corruption is most easily viewed as it pertains to the racing industry. It is a shame that the press now longer provides a check on the politicians and has let them get away with ruining Aqueduct for so long. With the media not reporting the facts the public is oblivious to the buffoonery associated with the Aqueduct VLT project. The only action taken here has been inaction. NYRA has waited for almost ten years to have slots installed while Albany continues to drag it feet. Worst yet is the process has relegated NYRA to a de facto ward of the state. Hanging onto the slots as its meal ticket, NYRA has been frozen into inaction awaiting the slots like a welfare mother awaiting the first on the month. Meanwhile the grifters in Albany are planning round five of the Aqueduct slots cash grab. Wasn't round four a enough of a laugh? Every time these politicians run this farce it slowly loses it's effectiveness to garner kickbacks and favor from those that desire the Aqueduct slots contract. There was a time when Las Vegas giant MGM was going to operate this casino. Then politicians stepped in, restarted the process four times and cashed in time after time with kick backs. Now it looks like this slots grab could garner very little interest in the gaming industry. Certainly the respected names in the gaming industry like Steve Wynn will have nothing to do with the farce of New York racing after four aborted slots approval processes. K&K wigs of White Plains may end up with a better casino than Aqueduct. While round five of slots cash grab commences the parasite known as NYC OTB is threatening to close down. It looks like they want to book bets without paying the track operators. If OTB was to have closed down ten years ago this could have been a huge positive for the industry. Racing could have shaken the image of the degenerate that is the popular image of horseplayers. The OTB should be something of the past. With this degenerate image in the past racing could have moved towards respectability. Perhaps mainstream marketers like Patrick Patten could have crafted a new imagine for racing away the crass materialism of naked gambling to something more gentlemanly or mainstream. The fear now is with racing in such a horrible condition that the loss of the OTB revenue may be a death blow; it is like starting a surgery while the patient is struggling to fight off an infection. The other fear is that the OTB fans may not return to bet; many of the old degenerates that filled the parlors will simply retire. OTB is a subject that will require leadership; however it seems to be a area steeped in corruption with a lack of vision. The only bright spot remains the upcoming Monmouth meet- perhaps even this could be a negative as it could be the nail in NYRA's coffin. With racing out of New York the entire industry may just lose it's national niche and become a provincial rural sport like rodeo. California racing is in trouble too. New York like California means big money and media presence. Without New York or Southern California racing is a much smaller industry. The looming triple crown is the one time where racing will hit the mainstream for a few weeks. This triple crown could be the calm eye of a storm. In a few years racing will likely have a much different look as the game is gutted. NYRA is guaranteeing the Wood Memorial pick 4 pool this year to be $500K; NYRA does this to let the players know that they expect $500K in the pick 4 pool. It looks like they drew up this number long before they drew the card. Pool guarantees are a marketing technique that usually helps inform the public of a larger than normal multi-race pool is expected and draws more money to that pool. However this time it looks like NYRA is going to have to pay to make good on this promise. 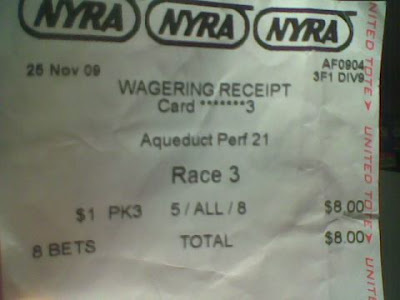 How does NYRA expect this sequence to attract $500K in action? Over the four races there are only 23 betting interests! This may be some sort of record for short fields in a New York pick 4 sequence. Can this be a foreshadowing of what to expect at the Belmont backwater meet once Monmouth opens? This pick 4 sequence is no compromise for quality, the sequence is lacking in quality competition as well. Three of the four races will have an odds-on favorite and if they all win this pick 4 could pay $20. The Bay Shore could easily be a N1X allowance and features a Contessa entry of uber-hyped Eightyfiveinafifty and Casteneda that will likely be 1-2 on the board. Then we have the Excelsior; a race named after the New York State motto which means "ever upward". With the complete moral bankruptcy of the New York state leadership the name of this race and the state motto has become a bad joke. Maybe a change to corruptus in extremis would be something that would suit the state/race better and provide an alibi for this and all future cards run at NYRA. The Wood is another six horse field. Maybe four of them have a square shot -I will try to beat Zayat's horse here- of winning this but for $750K you would think that more than six colts would line up in the gate. Munnings just absolutely lays over the Carter; a race with only five betting interests; Pletcher trains two in here. With the lack of entries, a dearth of quality, a void of competition, little interest on the part of the public, all enhanced by the moral bankruptcy of local officials- it looks certain that NYRA will have to pony-up to make good on this $500K guarantee. If things are this bad at Aqueduct how are things going to look when Monmouth is running $75K maiden and allowance races?